There are numerous ways to improve water use efficiency on farms, but a really good place to start is in the soil. The more effectively the soil is able to store water, the more efficiently this water will be used. I was really struck by something when visiting a farm a while back. I was walking around with the manager, digging holes in various camps to have a look at the soil in different areas. The farm had received a decent rain about a week previously. There had been no irrigation in any of the camps, so the most recent moisture was the same amount of rainfall on all the areas. We first went to a camp that had rich, dark soil with very high carbon content. The soil was still moist. We then went to a camp which had less carbon, and was not quite as dark. This soil was not moist at all. The camps were a couple of hundred meters from each other, both sandy soils and the only thing differentiating them was the carbon content. This just reminded me of the theory that I already know. Carbon in the soil significantly increases the soil’s ability to hold water. An increase of 1% organic matter (about 0.5% increase in carbon) can result in the soil being able to hold over 150 000 extra litres of water per hectare1. That is a huge amount! Just in case you are sceptical of the research done in other countries, we have done some ourselves. Below is a graph showing the association between water holding capacity and soil carbon on the farms we work on in the Eastern Cape. There are 431 samples included in this analysis, taken at 0-15cm; 15-30cm; 30-45cm and 45-60cm depths. 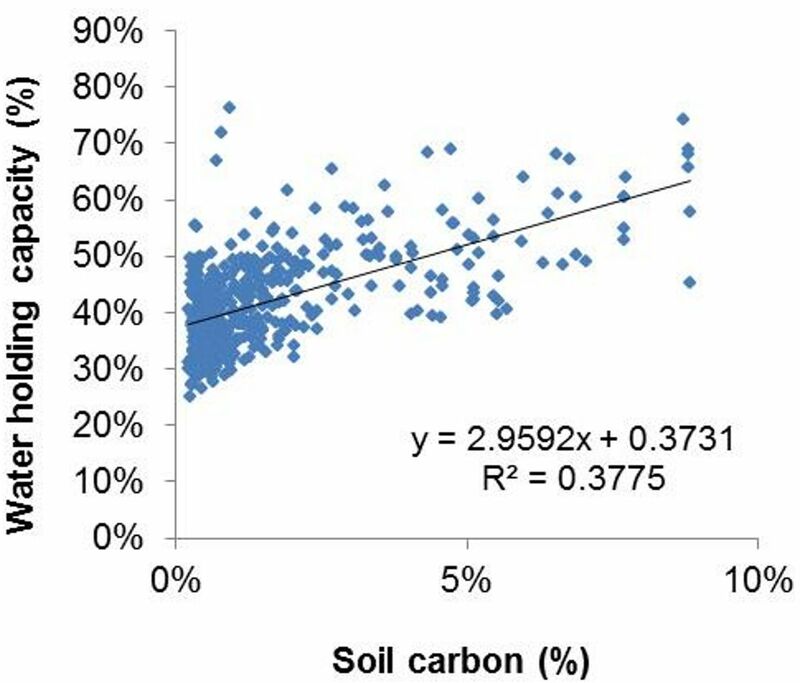 The formula in the graph shows us that we can calculate the average water holding capacity of a soil if we know the soil carbon percentage. For those who don’t like doing the math, I have included a second graph by way of example. The second graph shows how much water, in litres per hectare, can be held by a soil relative to the soil carbon level. 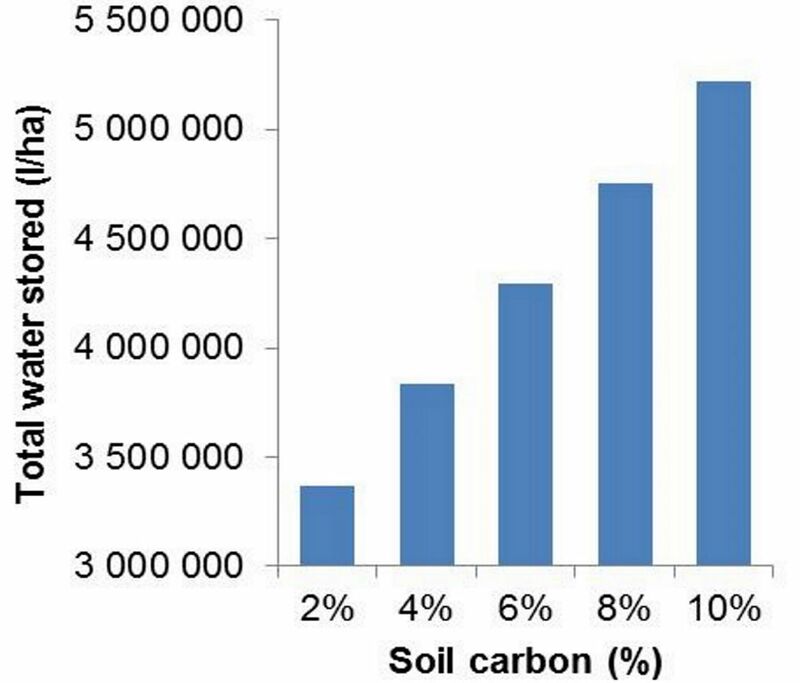 This graph shows that each percentage increase in soil carbon results in 230 818 more litres of water stored per hectare. That is a massive amount of water. Increasing soil carbon levels is therefore a key factor to improving water use efficiency on farms. Note: I have used an average bulk density of 1.3 g/cm3 and a 60cm soil depth.